If you thought that your days of beach combing were behind you, just because you roll instead of walk, then think again. Believe it or not, you can enjoy the beach independently, thanks to good folks down in San Diego. That’s right, you can now cruise along the sand in a power beach wheelchair, on one of five San Diego beaches. Even better – it’s absolutely free! Power beach wheelchairs are somewhat of a cross between those manual beach wheelchairs with the big balloon tires and a power wheelchair with a joystick control. After a brief orientation from the lifeguard, you’ll be tooling along the beach, as they are very easy to operate. 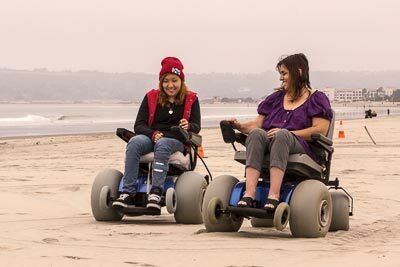 These power beach wheelchairs are also an excellent option for slow walkers, as you’ll be able to explore the beach without tiring out. The power beach wheelchairs are available at lifeguard stations at Coronado Beach (619-522-7346), Silver Stand Beach (619-435-0125 ), Imperial Beach (619-685-7972 ), Mission Beach (619-980-1876 ) and Oceanside (760-435-4018). Although advance reservations are suggested for peak times (like weekends) they are usually available on a walk-up basis during the week. Just roll-up to the lifeguard station and press the buzzer and ask them if any power beach wheelchairs are available. It’s that simple. So slather on the sunscreen and get ready to enjoy the beach this summer. It’s just one more thing that you can do!! This entry was posted in Recreation and tagged access, barrier-free, beach, Coronado, Imperial Beach, Mission, Oceanside, power, recreation, San Diego, Silver Strand, wheelchair by Candy B. Harrington. Bookmark the permalink.